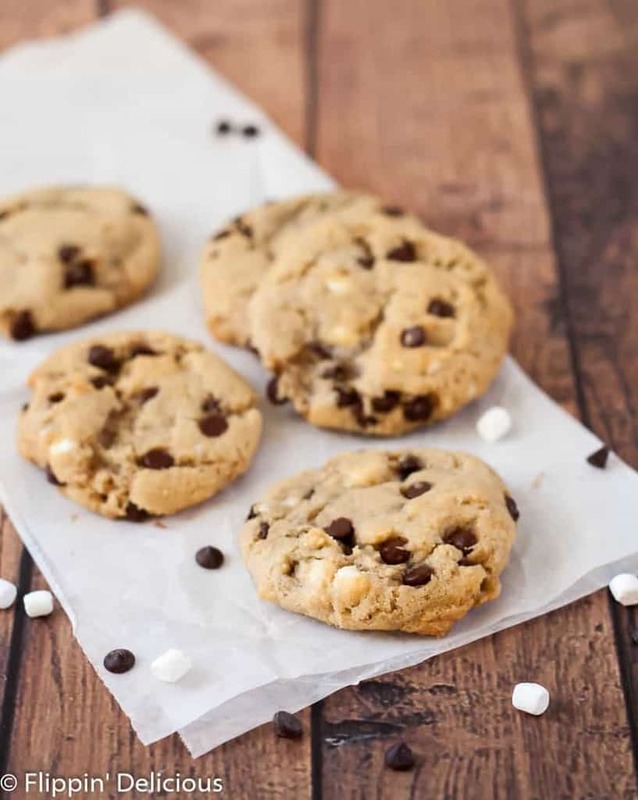 Dairy Free Gluten Free S’mores Cookies- perfectly chewy and gooey, loaded with mini chocolate chips and mini marshmallows. 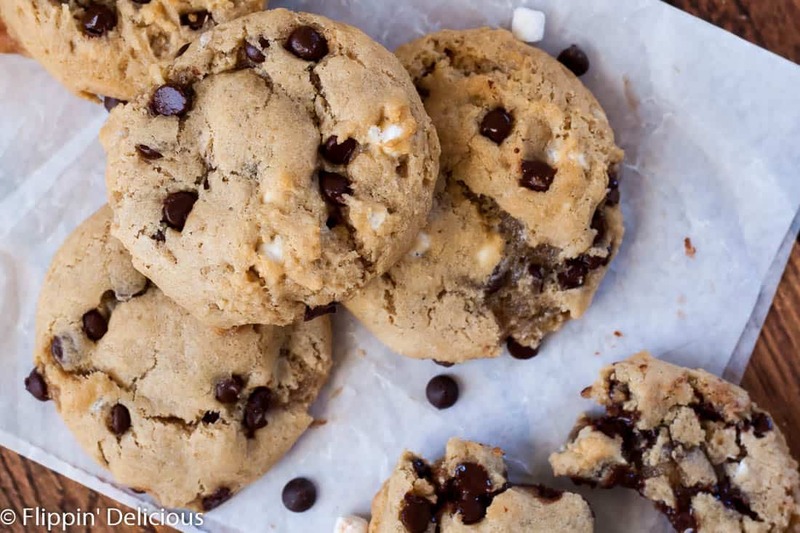 How did these dairy free gluten free s’mores cookies come to be? 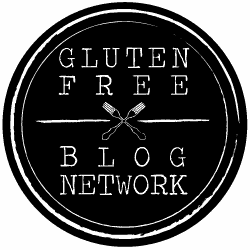 I worked many hours creating the recipe for what I feel like are the ultimate gluten free chocolate chip cookies. Of course, I made them giant too. 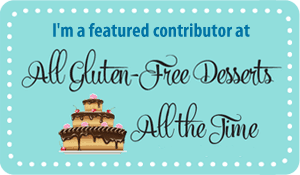 I have since put many spins on that cookie recipe (many of which are in my cookbook, The Essential Gluten-Free Cookie Guide.) 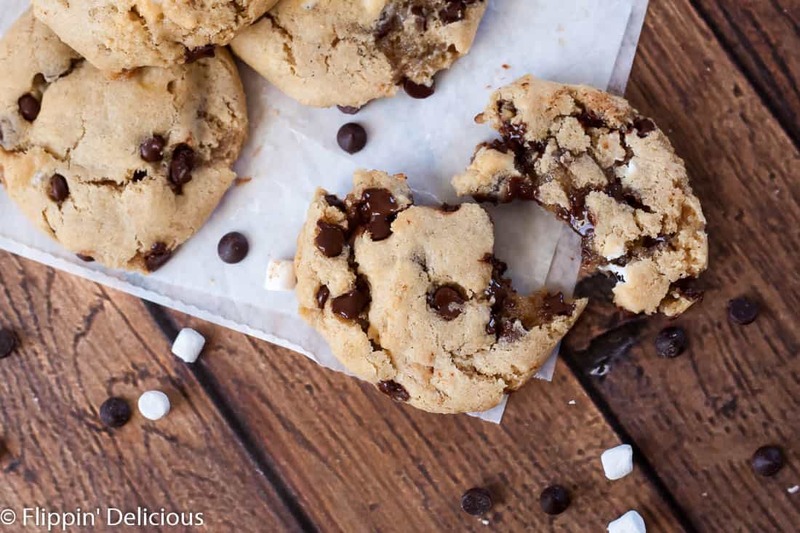 One of the recipes in my cookie guide is a super gooey gluten free s’mores cookie. The s’mores cookie was born during the summer that I ran my gluten-free baking company. On a whim I threw some marshmallows into my giant gluten free chocolate chip cookies before baking them. The results were super gooey chocolate cookies with melted marshmallow seeping out of the edges and caramelizing. They tasted amazing, but they looked super gross. My hubby said the marshmallow looked like boogers. I still tried to sell them at the Farmer’s market. The plain chocolate chip cookies were more popular, but everyone who tried the s’mores version loved them. There was a grower a few booths over whose teenaged daughter stopped by and traded me some very hot and spicy green chile (I made a lot of good trades for cookies that summer. Kale, grass-fed ground beef, eggs, pecans…) for a s’mores cookie. She didn’t care that the melted marshmallow looked…questionable. She devoured it and then came back every other week that I was at the market and bought a giant chocolate chip cookie. She’d ask if I had made any s’mores cookies and was always disappointed when the answer was no. When I first started brainstorming gluten free cookie recipes for The Essential Gluten-Free Cookie Guide I knew that I had to make a gluten free s’mores cookie that didn’t look like it had boogers seeping out of it. I discovered that I could carefully place marshmallows on the top of the cookies half way through cooking and they would be perfectly toasted on the top, instead of melting into funky puddles of goo. I was quite satisfied with the results, and that is the recipe in my cookbook. 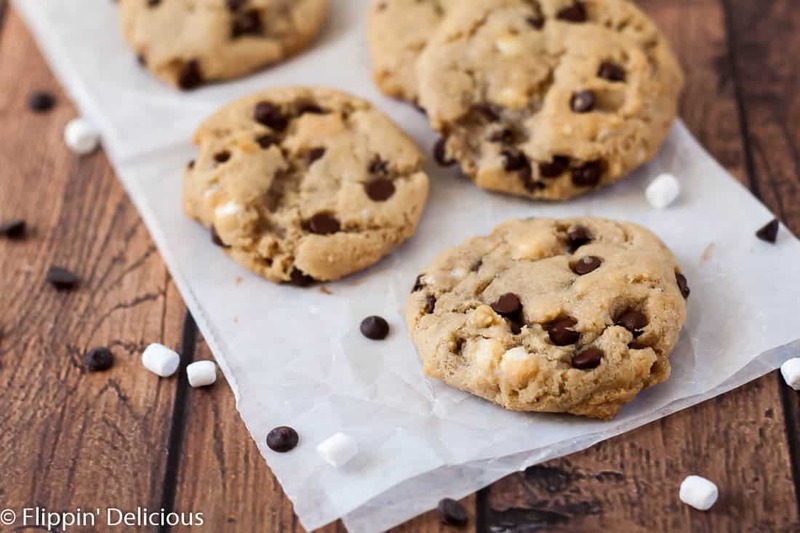 I tried mixing the freeze-dried mini marshmallows into my gluten free chocolate chip cookies and the result was the perfect gluten free s’mores cookies, with no melted marshmallow goo! 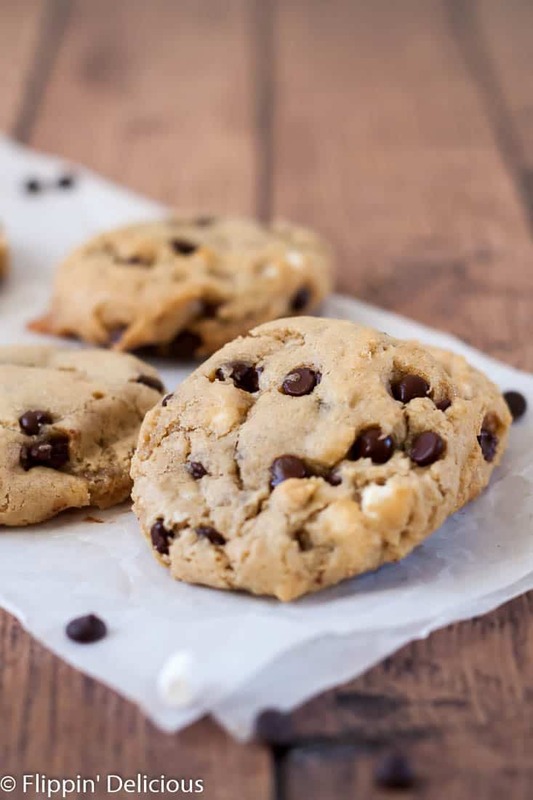 The marshmallows retain their shape but absorb a little moisture from the cookie dough so you still get a little marshmallow “goo,” just not the boogery kind. When I baked these cookies (and made them dairy free) I used some buttery sticks (Earth Balance) and dairy free mini chocolate chips (Enjoy Life) to make them. I am still working on an egg-sub to make them vegan. It is trickier since this recipe uses just the egg yolks. Let me know if you have any success with egg subs! Watch me bake gluten free s’mores cookies with my kids on Facebook Live! Dairy Free Gluten Free S'mores Cookies- perfectly chewy and gooey, loaded with mini chocolate chips and mini marshmallows. They'll bring you to a campfire, without smoke-smelling hair. Cream together the melted buttery spread and brown sugar on medium-low speed. Add the egg yolks and mix until combined. Add the baking soda, salt, xanthan gum, and vanilla and mix until combined. Add the gluten free flour, and mix until incorporated. Then mix in the chocolate chips and freeze-dried marshmallows. The cookies should spread and will lose their doughy shine, but will still be very soft. Allow to cool on the baking sheet for a few minutes before moving to a cooling rack to finish cooling. These look really good! However, the Earth Balance sticks contain soy, which I am allergic to. Do you think the Earth Balance spread in the tub might work or Spectrum butter flavored shortening? Hi Linda! Earth Balance actually makes soy-free sticks, which I LOVE and use often. Not every store stocks the soy-free sticks, so I use the locator on Earth Balance’s website whenever I need to make something soy-free. You could also substitute Soy-Free Earth Balance from a tub, it is just easier to measure with the sticks. I haven’t worked with Spectrum butter-flavored shortening, so I can’t tell you how that would work. There say put in salt and in recipe there no sign salt in it?? My apologies, I usually just add a pinch of salt. I have updated the recipe. Ummm… can you send some to me 😉 These looks so amazing and perfect, and just… yummm! These cookies do like flippin delicious! And less messy then having kids make s’mores themselves! Thanks Cricket! Yes, definitely less messy, but just and delish! Those are some beautiful looking cookies! Such a fun summertime treat! Omgosh yes! This looks so good! Uh-mazing! And I love the camp-fire-free-ness of them. 😉 Can’t wait to give them a try, Brianna! Thanks Raia! I hope you and your kiddos enjoy them! I’m getting a shipment of marshmallows in to sample, this seems PERFECT! I love s’mores. Gluten free options are hard to find. Thank you for sharing. Skip the fumes of the campfire and eat these beauties–sign me up! So festive and fun! Kids of all ages love these. the gooey marshmallow sounds so good! great recipe! These would be so perfect to share at a summer cookout. Thanks for the terrific recipe! You are very welcome Johnna! These look Ah-mazing! And the booger goo…story of my life with 2 kids! Haha. I am glad that you can relate. I figured if nothing else, the booger goo story would give another mom a chuckle. These are the softest, most delicious looking cookies EVER!!! 🙂 Thanks Lauren! I hope you enjoyed them.